Adams first came to national attention in the late 1860's/early 70's with a series of well-researched articles analyzing and attacking the promoters and speculators who were at that time attempting to gain control of the Erie Railroad. Gathered into a volume known as "Chapters of Erie and other Essays" (1871), these articles, even today, occupy a central place in the literature of railroads and stock speculation. Further enhancing his reputation through his activities as chairman of the Massachusetts Board of Railroad Commissioners (1872-79), Adams was appointed chairman of the government directors of the Union Pacific Railroad in 1877 (serving until 1890) then, later, appointed the railroad's president (1884). Adams served as U.P.R.R. president until being ousted by Jay Gould and his cronies in 1890. In addition to his other accomplishments, Adams became a distinguished historian in his later years. His contributions relating to the diplomatic history of the Civil War were particularly valuable, since he was able to use much material which was simply not available to other historians, among such material being the papers of his father, the distinguished American diplomat Charles Francis Adams (1807 - 1886), who served as U.S. minister to England (1861-68). 1884, Montana Territory. Stock certificate for 20 shares. Black. Issued to and signed twice by Charles Francis Adams, Jr. (1835 - 1915) Grandson of Louisa Catherine and John Quincy Adams; served as a colonel in the Union Army during the Civil War; Railroad Executive following the war. Minor glue residue at left margin from stub. Fine. Stamp and hole punch cancellations affecting Adams' signature as president. His signature on verso is unaffected. 1942, Stuttgart, Germany. 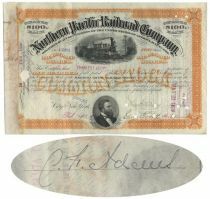 Stock certificate. Light Green/Black/Pink. Ornate piece. Mercedes logo at center. One hole punch cancellation. Excellent. 1888, New York. Stock certificate for 100 shares. OrangeBlack. Engraved vignette of a steam locomotive at top center, nice portrait vignette of Frederick Billings at bottom. Issued to and signed on verso by Charles F. Adams. Punch cancellation does not affect Adams signature.